The importance of artists websites to promote you artwork. How to create an artist’s website for little or now cost. My Painting With Watercolors website has been up and running now for about two years and I thought I would make my first post for the New Year one which lays out the goals I have for my website. Painting with Watercolors initially started as a support site for my weekly watercolor painting students. However over the last couple of years it has grown well beyond that with about 300 people visiting the site each day from over 100 different countries. It has been a lot of fun for me to see it grow like this and I like getting feedback from watercolor artists, both beginners and others, about the site. Currently there are 21 watercolor demonstrations on the site of which 19 are step by step demos and two are video demos (one watercolor painting and other Pen and Ink). In addition to the demonstrations there are many other articles on watercolor painting techniques and various tips which I hope are of benefit. I have also appreciated the regular downloads of the demos which have contributed greatly to supporting this site. OK , so much for the past, what is in store for 2013? Well I would like to create more step by step demonstrations, hopefully pushing the number to over 30 by the end of this year. 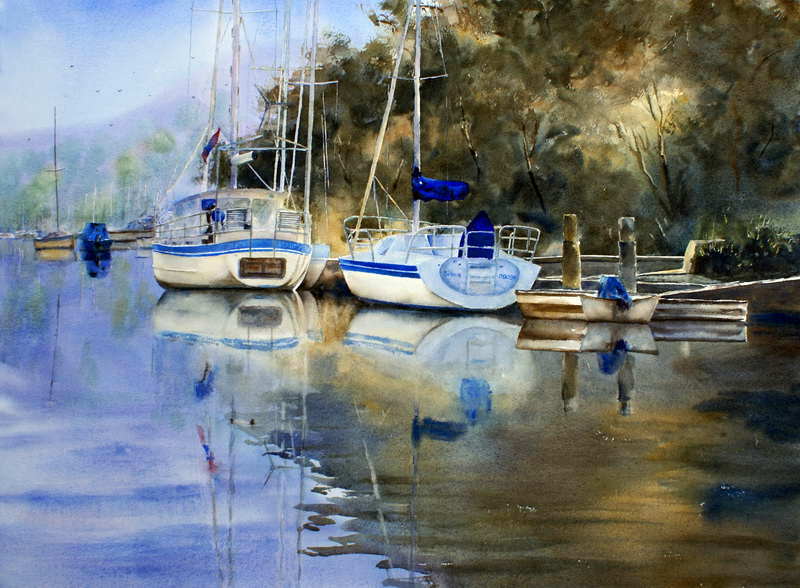 I am keen to try and further develop this community of watercolor painting enthusiasts by setting up a Forum on the site which will enable others to more easily communicate with myself and other like minded people. This will be very much dependent on how well I can keep the spam under control – my previous effort did not go so well but I have learnt a lot since then. I am in the process of redesigning the site to incorporate this forum feature and hope to have it up and running by the end of January 2013. Finally, I intend to produce more video demonstrations, most of these will be on a paid basis but some will also be free. In either case they are not expected to be very expensive. My idea is to produce watercolor painting demonstrations similar to what occurs in my weekly class. In this way they should help anyone trying to learn how to paint with watercolor paint but are not able to attend a regular class. I have a few other ideas on how to develop the site but they may not occur so I will not list them here. To finish off I would like to wish you all a wonderful 2013 and hope you achieve all you set out to do for the year.